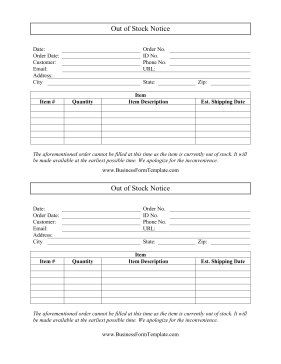 This free, printable out of stock notice can be filled out by employees and warehouse or factory workers, and then placed on the shelf in lieu of the actual product. Order numbers, ID, items, descriptions and shipping dates can all be filled in. The aforementioned order cannot be filled at this time as the item is currently out of stock. It will be made available at the earliest possible time. We apologize for the inconvenience.